Bowl for Kids' Sake raises approximately a third of the annual budget… making a BIG impact on the number of children we're able to serve each year. Read the stories of the impact of having a Big Brother or Big Sister. The 2019 theme is The SUPERHERO SQUAD! Dust of your capes and break out your masks. In 2018, we revealed our new branding and stepped up as Defenders of Potential. Get your team together and show us your best hero! 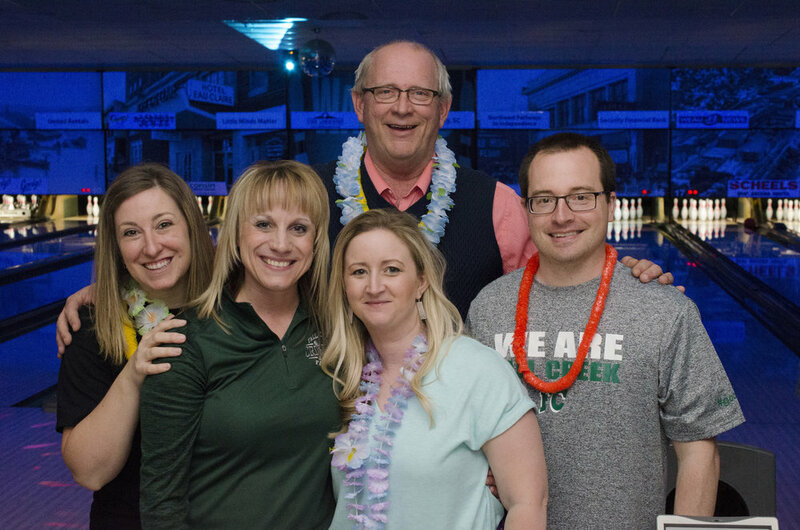 Mark your calendars and get a team together to participate in Bowl for Kids Sake 2019! Keep checking our website, more details will be available soon. Form a team of 4-6 people – Friends, co-workers, family, or anyone you’ll have fun with! Collect pledges – Each person collects pledges to participate in the event. Each person is asked to raise a minimum of $100 per person to participate, but you can raise more! The more money you raise, the more prizes you get, and the more children you’re able to impact. Bowl & have fun! – Come to the event and have a ball! Each event features food, music, games, prizes, raffles, and more! There’s something for everyone. If you have a large group or organization that plans to register 10 or more teams, we would love to get your bowlers oriented by planning a kick-off! We’ll get your participants excited, talk fundraising best practices and share information about Big Brothers Big Sisters. // Email Teri-Gene Conlin to schedule your kick-off today! Interested in sponsoring Bowl for Kids' Sake and showing your support of Big Brothers Big Sisters to hundreds of people? View the Chippewa Valley and St. Croix Valley sponsorship opportunities or contact Teri-Gene Conlin with questions. Brochures, pledge sheets, and posters are available for you to download. Don’t see what you’re looking for? Call 800-648-1696 or email Teri-Gene Conlin. Download these bowling pin-ups, print them off on colored paper, and sell them for $1 to help raise money for your team! Please print off the brochure relevant to your city. Please use the pledge sheet to record any donations you collect in person. Note: if your donor wants a receipt be sure to mark that on the pledge sheet and turn it in with your money at the event. Print off the poster for your city and hang it in your break room, office, or other high visibility location. Posters are formated for an 11x17 (tabloid) page. Want a lot of them? // Let us know! Each year businesses, organizations, and teams challenge each other to see who can raise the most money to support mentoring in Northwestern Wisconsin. A traveling trophy is awarded to the business, organization, or team that raises the most money in each category. Winners are awarded the trophy in late May or June. In order for a challenge category to take place, there must be a minimum of 5 businesses, organizations, or teams (for Friends and Family). Unless indicated, each category is business/organization versus business/organization. The business or organization that raises the most money wins the challenge! In the case of Friends and Family, the team that raises the most money wins. (There is no limit on the number of teams per business or organization). The team captain MUST register the team for the challenge category when he/she registers. The team captain selects the category the team/business would like to participate in. All money received through the deadline date (one week after the final bowling event in each area) will count for the team challenge. To qualify to win the team challenge the total amount of money the business raises must average out to at least $100 per bowler. Additional team challenge categories can be added if there are enough businesses, organizations, or teams to compete. Contact TeriGene Conlin 715-835-0161 to ask about creating a team challenge category. The more money you raise the more children you’re able to benefit through the power of mentoring – which we know is incentive enough! But we also want to reward you for your hard work in supporting Big Brothers Big Sisters of Northwestern Wisconsin. $100 in gift certificates, Framed Team Photo, & $10 to Action City for each member. Online - Visit the Registration Page. How do I register my teammates? The Team Captain can register his or her teammates either online or by paper. Online - Create a username and password for each teammate and enter their information into the registration form. This will register the teammate and create an online donation page for them. Paper Form - the paper registration form is designed to be able to register all team members on a team. Teammates can also register themselves using one of the above options. The registration fee is $25 and is 'good faith' money that your team will participate. This secures your lane to ensure you will have a place to bowl the night of the event. Many of our shifts fill up. It counts towards the Team Captain's total pledges. Online - Go on to your online donation page and make a $25 donation to yourself. Mail - Send in a check via mail to: 424 Galloway Street, Eau Claire WI 54703. When the Team Captain registers, an invoice will be emailed to the captain if the registration fee hasn't been paid. Teams consist of 4 to 6 people, but the ideal team size is 5 due to the amount of time it will take each team to bowl. Can I bowl if I don't raise $100? We really want the bowlers to try and raise at least $100, but if you fall short, you will still be allowed to participate. 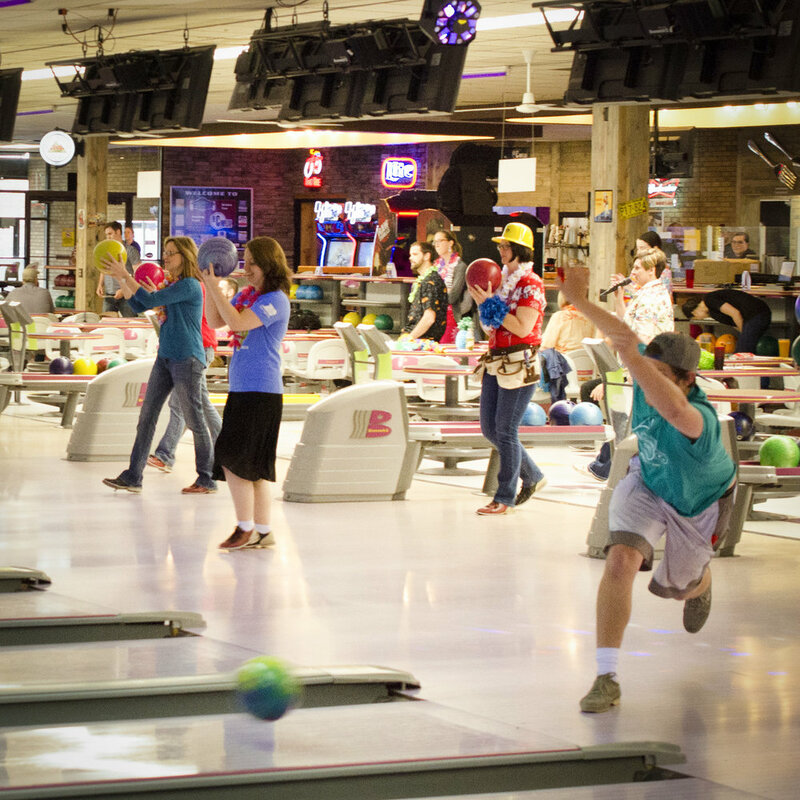 However, the $100 is important because we do have expenses related to the event, and it costs us between $20-$37 per bowler (depending on the city) for a bowler to participate in the event. That's why we ask each person to raise at least $100. Is a certain shift filled? If a shift is filled, it will be noted on the main page of the online registration system/donation pages. Or if you want to find out, contact Teri-Gene Conlin at TeriGene.Conlin@bbbsnw.org or 715-835-0161. I forgot my username/password, now what? The Forgot Username/Password link does not work, contact Teri-Gene Conlin at TeriGene.Conlin@bbbsnw.org or 715-835-0161 to reset your password or retrieve your username. How do I collect pledges online? To collect pledges online, you must register online. This sets up a personal fundraising page for you. You can then email your friends and family the direct link to your page. You can even edit the photo, your goal, the page information, etc.